This book examines all aspects of the house church movement, including Frank Viola’s Organic Church and the Integrated Church. It is also called simple church, open church, integrated church, micro church, and organic church. There is nothing unscriptural about a church that simply meets in a house, but the house church movement is not merely about churches meeting in houses. We document a three-fold agenda of a large segment of the house church movement: (1) An agenda to remove Christians from pastoral protection, (2) an agenda to create the one-world church, (3) an agenda to build the kingdom of God. Many of the house churches are associated with the leaders of the charismatic latter rain apostolic revival movement. They expect the return of Christ to be preceded by a miracle-driven revival that will surpass even that of the first century. This is called dominionist or kingdom now theology. 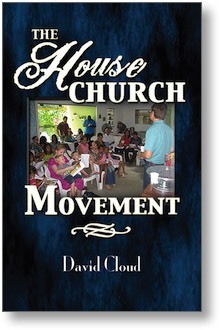 The book looks at the house church movement both in regard to its dangers as well as its challenges.